Blowout Sale! 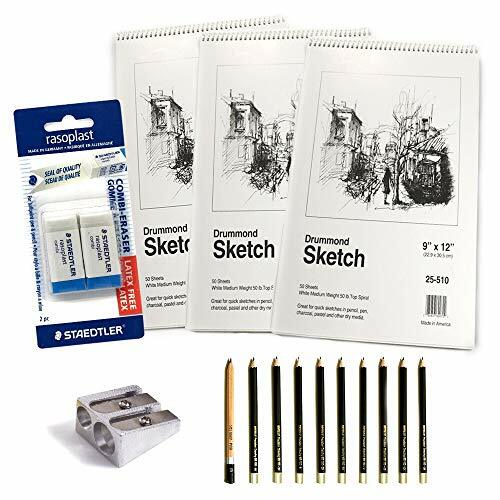 Save 68% on the Deluxe Art Set Includes 3 Sketchbooks 150 Sheets total 10 Premium Pencils 1 Pink Eraser and 1 Single Hole Sharpener For The Ultimate Paper Kit (1 pck Drawing Set w/ 1 Staedtler Mars slide eraser) by mCasting at Stickman's Blog. MPN: DrawingSet. Hurry! Limited time offer. Offer valid only while supplies last. What is art without a reliable set of drawing materials? Is it a challenge to pick the right drawing pencil set when you are in an art supply store? Deluxe Drawing Set for Artists of All Skill Levels with a Passion to Create. Our 15 piece sketchbook art set includes 3 Sketch pads, 10 drawing pencils, 1 Staedtler Mars slide eraser, and 1 double hole pencil sharpener. Now you will have all the art supplies you need to capture your inspiration right at your fingertips. Professional Sketch Pads Made in The USA Are Ideal for Drawing and Sketching with All Kinds of Media. The set includes Three 9X12 top spiral bound sketch pads of 50 lb. medium weight. 50 sheets in each drawing book are great for quick sketches in pencil, pen, charcoal, pastel, and other dry media. Ideal for technique practice. Premium Drawing Pencils You Can Rely On. Our 10 sketching pencils (2b, 2h, 3h, 4h, 4b, 5b, 6b, 6h, h, b,) offer a core range of drawing pencils made high quality materials providing the tools you need to put your inspirations on paper with confidence. We Know That a Quality Eraser and Pencil Sharpener Is Essential in The Creative Process. A clean quality eraser to help you tidy up any areas when needed and an art pencil sharpener with stainless steel blades that give you precise and sharp pencil points and cuts, and last much longer. Get Your Drawing and Painting Essentials Here. This sketchpad art kit is great for both beginners and professional art enthusiast. An all in one drawing set that you can rely on whenever the mood strikes to create. All you need and for a great price. Premium Drawing Pencils You Can Rely On. Our 10 sketching pencils (2b, 2h, 3h, 4h, 4b, 5b, 6b, 6h, h, b) offer a core range of drawing pencils made high quality materials providing the tools you need to put your inspirations on paper with confidence. If you have any questions about this product by mCasting, contact us by completing and submitting the form below. If you are looking for a specif part number, please include it with your message.